The foundation that answers all your glowy skin needs. As of recently I’ve changed up my skincare and makeup routine for a healthy and glowing complexion. 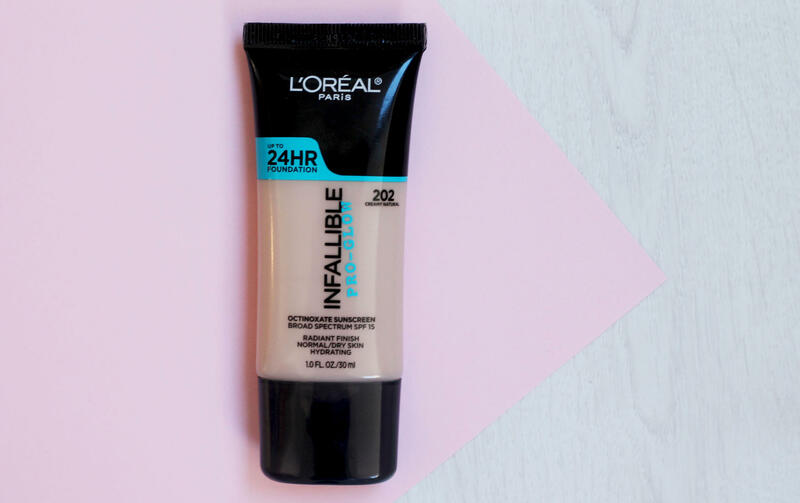 Gone are the days of full coverage matte skin, thanks to the new L’oreal Infallible Pro Glow foundation $12.99. Whilst browsing the aisles of CVS in New York at the start of the month I spotted the L’oreal Infallible Pro Glow foundation sitting there in all its glory. I have heard a lot of good things about this (thanks to Lustre Lux and her review video with all the shade swatches). Picking my shade was tricky, but with working in the beauty industry I know my own skin tone and managed to match myself up correctly. Drugstores in the US don’t have testers for their foundations, not sure why so you just have to guess or search online beforehand. If this is the case, make sure you watch Lustre Lux’s video, she has all 12 shades swatched for you to see. I picked up the shade 202 Creamy Natural and it matched perfectly, it’s slightly on the lighter side but it has a warm undertone which is what I prefer. This foundation claims to last for up to 24 hours and is ideal for normal and dry skin types. This foundation also has SPF 15. I have a normal skin type with an oily T-zone, I normally have to powder down my T-zone throughout the day. I’ve not tried this foundation for 24 hours straight because lets be honest, who wears foundation for 24 hours? However it lasted pretty well for my 8-9 hour shift, it didn’t look cakey or separated when I got home which is a plus, as most foundations separate on my skin throughout the day. I’ve tried and tested this foundation on a full day at work (9.30-6pm) and I only had to top up my powder once at lunch time. I wear this foundation with a hydrating primer underneath, I use Marc Jacobs coconut primer $44 for this. Every time I wear it I get a lot of compliments about my skin, i’ve been told my skin looks glowy and healthy which is what I like to hear. I have a lot of love for this foundation, it’s become my new go-to. Come on L’Oreal and launch in the UK, I’m dying to try more shades. Have you tried the L’Oreal Infallible Pro Glow or do you want to?